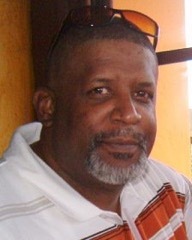 Charles Wesley Hicks, Sr. was born January 21, 1957, in Corona, CA to the late Charles A. and Betty Jean Hicks. He was a curly headed, brown eyed boy that was adored by his parents, grandparents, aunts, uncles and cousins. Charles was lovingly known as “Hicks”. Hicks was a big name for a little kid but he grew into it and wore it well. Hicks was born into a military family. When his father was away serving his country, his family stayed often with grandparents. Other times they would travel with their father across the country. Hicks grew up with a strong sense of family traveling often to Texas to see both his paternal and maternal relatives. Hicks enjoyed roaming the country roads and learning about country life. In 1968 his family relocated from California to Yuma, Arizona where Hicks and his brother honed their outdoorsman skills – hunting, fishing, boating, ect. In 1972, they relocated to Orange County where Hicks was a standout student and athlete. He played football, ran hurdles, high jump, track and baseball. He also sang in the choir. He continued playing sports in college. Hicks discontinued college sports due to a football injury. However, Hicks later completed his AA college degree. Hicks worked in the electronic sound system industry for many years and later operated a successful business in sound system and alarm installation. He also started a limousine and trucking transportation service. He later used his skill and knowledge of sports and life experiences to coach and mentor high school and college students. After retirement, he continued to mentor and coach. After retiring Hicks became a gardener extraordinaire. He enjoyed planning and taking road trips across the country from coast to coast including family reunions and cousin day camping. Hicks was a generous person especially with his talents, skills and time. One of his greatest achievements was to see the success and accomplishments of his children Joy and Charles Wesley, Jr. Hicks played a key role in raising his God Children. Hicks adored his nieces and nephews and always encouraged them. He was the oldest child and fortunate to have a best friend and younger brother and a baby sister that he loved very much. He was a gentle person that could gut a wild animal for dinner or tend a beautiful rose garden. Generations to come will hear of “Hicks”. Hicks was a multitalented man who could navigate the country roads of Texas, the deserts of Arizona, the streets of LA, the streets of the OC, and the suburbs of Corona and Pomona. He leaves to cherish his memories his devoted and loving wife, Lori of 11 years; his son, Charles Wesley, Jr.; his loving daughter, and “Joy” (Chantal); his cherished granddaughter, Melody; his brother and friend, Daryl; one dear sister, J. Yvette; two adoring nieces, Britney Jean and Alicia Mims (David); three great-nieces, Briahna, Alanah, and Ari; one great-nephew, Donovan; God-children, Shatera Ferrell, and Elijah Daniels; mother-in-law Mae Daniels; brother-in-law Scott Ferrell; five Aunts, Sammie Allen, Hellen Jones, Glenda Jones, Janis Jones, Johnetta Jones and a host of other family members and friends.